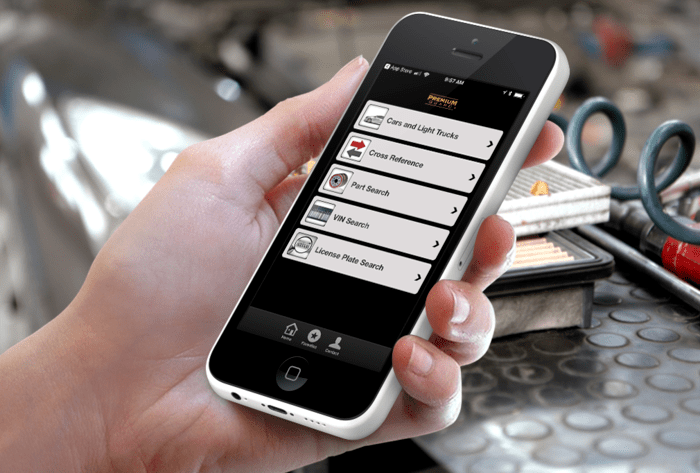 Memphis, TN, April 24, 2018 – Premium Guard, Inc., a leading supplier of a full line of automotive and light-duty oil, cabin, air, fuel, and transmission filters, continues to innovate and make the process of finding the correct filter for you or your customer’s vehicle easier by adding the option of license plate search to its mobile apps to further facilitate the process. Now, customers are able to search the Premium Guard catalog utilizing the new license plate option. Simply choose the state then type in the vehicle’s license plate number to see the list of filters available for that vehicle. The installer has multiple ways of locating the filter they need for their specific application via the Premium Guard mobile app. Other valuable tools already integrated into the apps include cross-reference, application, Premium Guard part number searches, and the VIN scan option. Download the free app today to view the new feature and simplify your online part search. To access the iOS compatible app, click here. For Android users, click here. Anan Bishara, CEO Premium Guard, Inc. Premium Guard, Inc. is a leader in the automotive filters aftermarket value segment. Premium Guard offers proven quality and market appeal and nearly complete application coverage. Learn More.